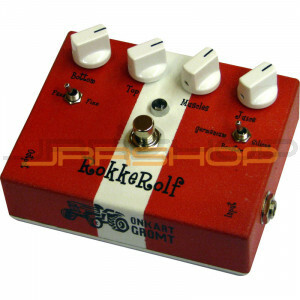 This pedal distorts the guitar signal in a harmonic way. It is very versatile and has a wide spectrum of sounds. The left swich is a filter for the midrange. "Bråk" is flat range and "Ståk" is a notch filter around 2500Hz. "Groms" controls the amount of bass from the guitar. "Kvassleik" is the treble control. "Hardleik" is the gain and amount of distortion, and finally; "Lydmengd" is the volume. The right swich (not in this picture, see the link More pictures) changes between different colours of the sound. "Germanium" gives a brown and fat sound. "Transistor" acts as a booster up to a certain level before it starts clipping. "Silicium" has a sharper tone and more treble. Uses 9V battery or standard Boss DC adapter.